Syria's alleged use of chemical weapons wouldn't be the first time that some kind of crisis in another country or a perceived threat has prompted U.S. military action. There have been other so-called tipping points that the U.S has pointed to to justify military action in the past. More than a year ago, U.S. President Barack Obama suggested the Syrian regime would be crossing a "red line" if it deployed chemical weapons against its citizens during its ongoing conflict. With claims of a chemical attack near Damascus that may have killed hundreds of people, it seems that line has been crossed. The White House has indicated there will be some kind of response, but that regime change is off the table. However, Obama is reportedly weighing military options, possibly some kind of limited strike. It wouldn't be the first time that some kind of crisis in another country or a perceived threat has prompted U.S. military action. There have been other so-called tipping points that the U.S has pointed to in order to justify military action in the past. President Ronald Reagan had always been wary of the tiny Caribbean nation. He feared its close ties with communist Cuba and pro-Soviet Nicaragua could lead to the formation of some kind of Caribbean "red triangle." Reagan was also concerned about the military potential of a 3,000-metre runway that he said "looked suspiciously suitable for military aircraft, including Soviet-built long-range bombers." Syria and poison gas: Will we ever confirm what happened? Following a 1983 coup in the country, Reagan addressed the U.S., saying the leader who had just been deposed had been replaced by someone "more radical and more devoted to Castro's Cuba." He claimed that the security of about 1,000 Americans in Grenada, most of them medical students, was at risk and that they could be harmed or held as hostage. Reagan ordered a U.S. force of 5,000 troops to the island, who quickly defeated the Grenadian and Cuban forces. General Manuel Noriega at one time had been a CIA informant and considered a Cold War ally of the U.S. But relations began to sour when he became a military dictator in 1983. And he was later indicted by a U.S. federal grand jury in 1988 on drug trafficking charges. When Noriega's puppet candidate lost in the 1989 Panamanian election, Noriega nullified the results. U.S. President George H. W. Bush "was appalled by Noriega's thwarting of democracy and began to focus on removing him from power," according to the University of Virginia Miller Center website. In December of that year, Bush addressed the U.S. public, saying that Panama had declared to be in a state of war with the U.S. (although Noriega disputed that interpretation). Bush said forces under Noriega's command had shot and killed an unarmed American serviceman, wounded another and arrested and brutally beaten a third. Bush suggested that these threats marked a tipping point and had created an "imminent danger to the 35,000 American citizens in Panama." He launched "Operation Just Cause" with about 10,000 U.S. forces, who joined 13,000 forces already there. They overtook the Panamanian military and Noriega eventually surrendered. In 1998, the bloody conflict between Serbian forces and Kosovar Albanians in the Kosovo province continued to escalate, resulting in thousands of civilians killed and hundreds of thousands of Albanians homeless. The outside world had condemned Serbian forces in the province and its excessive use of force. But no military action was taken. The U.S had been pushing for some kind of NATO-supported military initiative. But the Racak Massacre in mid January 1999 may have been the tipping point that triggered action. Serb security forces killed 45 Kosovar Albanians, in retaliation of four Serbian police officers killed by the Kosovo Liberation Army. Shortly after, and with U.S. prodding, NATO authorized airstrikes unless a political settlement could be reached, that included giving autonomy to the Albanian majority in Kosovo. Negotiations followed at Rambouillet, France. But an agreement couldn't be reached with Yugoslav leader Slobodan Milosevic and Serbian military and police forces stepped up their operations against the Albanians. By March 1999, as NATO airstrikes were being prepared, U.S. Ambassador Richard Holbrooke went to Belgrade to deliver a final ultimatum to then Slobodan Milosevic to stop attacks on Kosovar Albanians. Snubbed by the Yugoslav leader, U.S and NATO forces commenced airstrikes the next day. 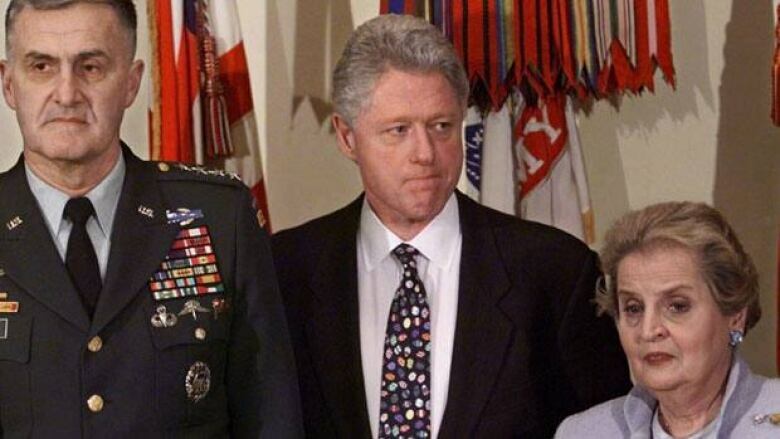 On March 24, President Bill Clinton made his case to the American public, informing them that military airstrikes were being launched at Serbian forces "responsible for the brutality in Kosovo." He said it was in America’s national interest to prevent a wider war, and argued they had a moral duty to protect thousands of people in Kosovo who were being ruthlessly killed by Serbian leaders. Clinton said that Milosevic would view hesitation to act as a "licence to kill. There would be more massacres, tens of thousands more refugees, more victims crying out for revenge." The air campaign lasted for 77 days until Serbian forces withdrew. 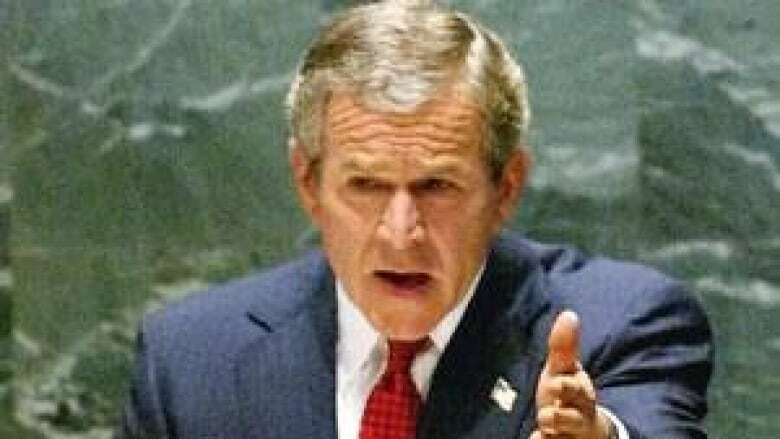 In wake of the September 11, 2001 attacks, President George W. Bush made the case that Saddam Hussein's regime possessed weapons of mass destruction and posed a serious threat to the security of the United States. By November 2002, UN resolution 1441 was passed, which demanded Iraq give unfettered access to weapons inspections or face "serious consequences." Iraq did allow weapons inspectors in, who found no evidence of stockpiles of WMDs. But the inspectors also accused the Iraqi government of being evasive. Inspectors said they needed more time to investigate but Bush claimed Iraq was stalling, and that U.S. intelligence and the intelligence agencies of other countries all believed the regime possessed WMDs. The president demanded full disarmament of Iraq. Although some members of the UN Security Council disagreed, Bush believed that the UN resolution authorized the invasion of Iraq if it wouldn't co-operate. Without UN backing, Bush forged ahead and gathered a so-called "coalition of the willing" which included Britain, to prepare for an invasion of Iraq. By March 17, 2003, Bush addressed the nation. He issued an ultimatum to Saddam and his sons: leave Iraq or face military intervention. Saddam ignored the warning and on March 20, U.S. forces invaded. Although the regime was toppled relatively quickly, the subsequent occupation lasted for years, at the costs of thousands of lives and billions of dollars. WMDs were never found, but Bush continued to endorse the invasion, saying Saddam still posed a threat, had plans to reconstitute WMD programs and that he needed to be removed.